Lombardy is a central point of reference for Italian cultural and economic life. From its diverse swathes of farmland to Milan, its buzzing economic powerhouse, Lombardy needs several visits if you're going to properly explore its many faces. The only place most visitors to Lombardy spend any time is Milan, the economic powerhouse of Italy. But to limit oneself to the capital of the north would be to ignore the natural wealth of the region. Lombardy is certainly in part urban, but it is above all a rural and agricultural land. The region concentrates 60% of Italian agricultural production on the fertile plains of the Po which it shares with its neighbouring region Emilia-Romagna. Almost 300 traditional gastronomic products can be sampled in Lombardy along 12 wine and testing routes. While Milan may have become an international metropolis, other cities, such as Mantova and Bergamo, also had their important aristocratic, land-owning families who played a game of one-upmanship in building sumptuous palaces, laying the foundation for an exceptional architectural heritage. These towns have grown up thanks to the fields that surround them which they have encroached upon and dried up. And then you have the famous Italian lakes, Lake Maggiore, Lake Como and Lake Garda with more grandiose landscapes and natural ostentatiousness all around. The great diversity of the landscapes between the plains and the mountains, the architectural heritage and the wealth of its gastronomy means that Lombardy merits more of your time. Once you've visited Milan, try the cities of Bergamo, Mantova, Pavia and Cremona. They are all more than worth the detour, shunning the economic world in favour of art and history gems. 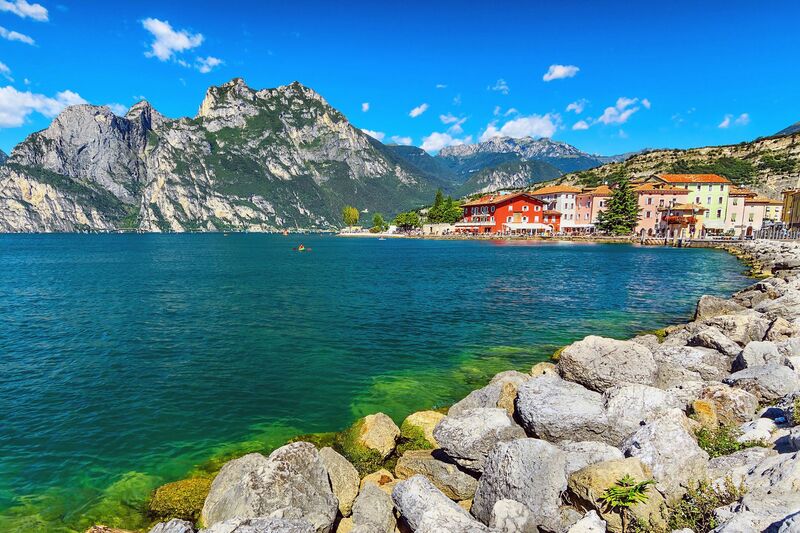 These marvels can be visited alongside the Italian lakes which, at the foot of the Alps, offer superb landscapes. Although Lombardy can be taken as an urban destination, it also has some natural aces up its sleeve, including the aquatic maze that is the Mincio Natural Park upstream from Mantova. Mountain lovers, however, will go to the numerous valleys of the Alps, whose best known spots are the Valchiavenna, Valtellina and Val Camonica. In the province of Sondrio, you'll also find the largest natural park in Italy, the Stelvio National Park. The animals and plants that live within this area are innumerable: ibexes, wild boars, eagles, fir, larch and pine trees rule the land virtually undisturbed by human presence. Those who love skiing will be spoiled for choice. The most popular ski resorts are Bormio, for years home to the World Cup races, Chiesa Valmalenco, Madesimo and Livigno. Located on the border with Switzerland, Livigno is also known for its enclave status and goods bought here are not subject to VAT. Besides being full of mountains, almost half of Lombardy's territory is made up of plains. This is the realm of important agricultural crops, most of all rice. Cultivated mainly in Lomellina, the Pavia area, it is one of the basic Lombard food stuffs. There are also pig farms, which produce fantastic salami and sausages, and cow farms for milk and cheeses, including grana, taleggio, quartirolo and stracchino. In Lombardy December 13 marks the traditional feast of Saint Lucia, the region's unique version of Father Christmas. Lucia is loved by children because she brings them gifts on the back of her faithful donkey. In return, children leave her a cup of coffee and a bit of fodder for the donkey. Around this period leading up to Christmas, Lombard cities are filled with hundreds of stalls, filled with candy and treats. The feast of Giubiana is another characteristic festival in Lombardy. This holiday is held today to celebrate the transition from winter to spring. Very popular especially in Brianza, it is celebrated on the night of the last Thursday of January. Great bonfires are built for witches made out of rags. Typical of Valtellina cuisine, pizzoccheri is a dish particularly well suited to high altitudes and low temperatures. The pasta is made of both wheat and buckwheat flour, which gives it a darker colour than the traditional pasta. Cut into fairly large strips, the pasta is then boiled, together with Swiss chard and potatoes, before being seasoned with Valtellina cheese, parmesan, butter and garlic. Its the perfect dish after a tiring day of exercise and hiking in the Upper Lombardy mountains. Be it basic working class meals, or the elegant dishes served up in the fanciest restaurants, Milanese cuisine boasts great variety and is known throughout the world. Milanese risotto seasoned with precious pistils of saffron, Milanese style lamb chops, Ossobuco (braised veal shanks) and panettone have all become part of the national culinary tradition. As for 'cassoeula', this is a peasant's dish composed of curly cabbage and the offcuts of pig meat, the origins of which are passed on through a legend: As the story goes, it was a Spanish soldier who taught the recipe to a working-class woman who graciously passed it on to the people she was working for in order to keep her job. A culinary tour of Lombardy would not be complete without discovering some of the best wines of the region. If you travel to the south-western part of Oltrepo Pavesan, you will find grape varieties with different qualities which are transformed into white, red or rosé wines. Then, if you travel west, between Brescia and Iseo Lake, it is on the terraced hills of Franciacorta that you'll find the grapes from which the famous sparkling wine is made. Finally, a stop at Garda Lake will allow you to discover the delicate flavours of Lugana or the Garda Classico wines, but if you want a stronger red wine, you should continue towards Valtellina. Find weekly weather forecasts for Lombardy . Different criteria make it possible to predict with precision the best time of year to go to Lombardy . A comprehensive weather score, made up of temperature indicators, bad weather predictions, sunshine levels and wind speeds, will allow you to choose the activities best suited to the weather conditions and therefore make the most of your holiday in Lombardy . Milan is one of the world's fashion capitals, so any reference to shopping should not be taken lightly. Twice a year, it holds its famous fashion week, which sees catwalks featuring the most famous models in the world. Milan has some of Italy's most popular shopping streets. Famous designers such as Dolce & Gabbana, Trussardi, Armani, Prada and Versace are based in the city. For glitzy Milanese boutiques, head to the Quadrilateral, a district bordered by the luxurious Via Montenapoleone and Corso Venezia. Take a walk through the Galleria Vittorio Emanuele II, considered one of the main avenues for luxury shopping in Milan and a stunning gallery of vaulted glass. 29/06/2018 - Society Pineapple on a pizza - yes or no?